OCEAN FREIGHT IN RESPECT OF DEALING WITH INTERNATIONAL SHIPPING COMPANIES (U.S. FREIGHT FORWARDER, NVOCCs). EXPORT AND IMPORT. In international shipping of ocean freight from and to the USA, international shippers most of the time will deal with U.S. OTI – Ocean Transportation Intermediaries (U.S. Freight Forwarders or NVOCCs – Non Vessel Operating Common Carriers), which support ocean freight export and import from/to the USA. U.S. Ocean Transportation Intermediaries are international shipping companies that specialize in international cargo transportation by sea. In order to provide the service to international shippers, Ocean Transportation Intermediaries must be licensed and bonded. (Do not confuse with International moving companies that arrange packing, loads, cartage of cargo, but most of the time apply to U.S. OTIs for the international ocean freight service in order to ship cargo overseas). American Multimodal International Deliveries - AMID Logistics, LLC is a fully licensed and bonded U.S. OTI - international shipping company: Freight Forwarder. 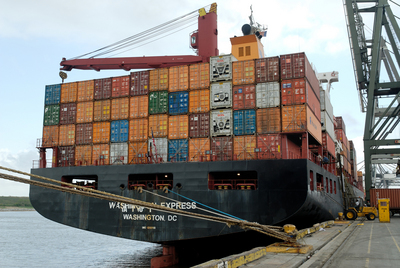 We perform both Export and Import services connected to international shipping of ocean freight from and to the USA. In respect of dealing with international shipping companies, international shippers should clearly understand responsibilities of international shipping companies on theirs international ocean freight shipments, depending on service selected – Export or Import and country, which international shipping companies locate in and/or represent. International ocean freight shipping companies throughout the world are governed by a variety of the global international ocean freight industry standards and regulation. Regardless of country where international shipping companies oprate its business, they adopted and extend rules promulgated by international ocean freight carriers organizations (IMO - International Maritime Organization for example). General rules in international shipping of ocean freight are common in all countries over the world. I.e. international shipping of ocean freight is regulated by international shipping rules, regardless of country of origin and destination in safety, environmental protection, documents turnover, general customs procedures, commercial practices, cargo liability and other issues. However different international shipping companies involved in the ocean freight business, in different countries or even in the same country, may differently operate ocean freight at their origins and destinations stations. Knowing basic details of local rules in countries of origin and destination gives to international ocean freight shippers an advantage to properly plan their international ocean freight shipments and forecast shipping cost related to it. U.S. OTIs - U.S. located international shipping companies - licensed and bonded Ocean Freight Forwarders and NVOCCs mostly concentrate on the U.S. Import and Export Regulations and handle issues related to international shipping of ocean freight in the U.S. commerce zone. U.S. located international shipping companies may also provide general details related to cargo tendering outside of the USA along with information on ocean freight carrier's handling station's agents overseas. In dealing with a U.S. located international shipping company on shipping ocean freight from or to the USA, shipper should also be prepared to deal directly with an another international shipping company/ocean freight carrier's agent, which will handle cargo on shippers' behalf as soon as cargo is out of the U.S. Commerce zone. With IMPORT of goods to the USA - in U.S. Freight Forwarder's shipping instructions, before an international ocean freight shipment is tendered to the Export from the country of origin. Very important that international shippers to be aware of common phases of international ocean freight shipments. International shippers of ocean freight should understand that each phase of ocean freight shipments may correspond with charges related to the phase. International shippers should divide parts of shipping costs collected by U.S. freight forwarder from parts of shipping costs collected by international shipping companies outside of the USA/carrier's destination agents. Notice: When your deal with an International Moving company (most of the time when shipping Household Goods from or to the USA), but International Shipping Company (Ocean Freight Forwarder, NVOCC, VOCC), these rules may not apply. Cargo Pickup and delivery at named place of: frontier, terminal, quay (if cargo is not self-delivered to the named place - an International Shipping Company ocean freight shipping terminal). Cargo handling at the International Shipping Company's ocean freight terminal in country of origin, export documents turnover etc. Goods are on board of vessel. Actual sailing of the ocean freight by sea. Ocean carrier's messaging and documents turnover. NOTICE: The ocean freight either for Import or Export may be subject to surcharges (samples of surcharges: war risk, Panama channel passing etc). Discharging international ocean freight at a port of entry, international ocean freight carriers/carrier's destination agent messaging, handling of cargo at the port of entry and documents turnover. Completing destination customs formalities by a destination customs broker in order to obtain a customs release on the ocean freight, i.e. entry filing, assessing customs duty, taxes (if any) and other applicable destination country's governments' related charges. Delivery of the international ocean freight shipment to the final destination terminal (if the terminal is not a sea port of entry itself). Handling the cargo at the terminal, documents turnover and a warehouse release at the final destination terminal. Delivery of international ocean freight by land to a named by consignee place (if it will not be self-picked up by the consignee from the final destination warehouse). In dealing with a U.S. International Shipping Company that locates and operates in the USA (U.S. Freight Forwarder or NVOCC), you should initially clearly understand in what kind of international ocean freight shipment you are going to be involved – Export from the USA or Import to the USA. Having it clear, you will be able to predicts on which phases of your international ocean freight shipment you mostly transact with an U.S. International Shipping Company and on which phases with a not U.S. International Shipping Company / ocean freight carrier's agent designated to your international ocean freight shipment. Then international shipping costs related to each phase of your international ocean freight shipment, in invoices received from international shipping companies that you use on your Import or Export to or from the USA, will be clear and comprehensive. I.e. you will be able to understand and control your entire international ocean freight shipment: the international shipping procedure and the shipping cost. Announcement: In March, 2013 we have launched a Beta version of online application Freight Calculator Creator that is targeted to professionals in the International Cargo Transportation Industry (Freight Forwarders, NVOCC, VOCC, 3rd party logistics, Customs brokers etc). With this application, international shipping companies can INSTANTLY build on-line freight calculators by uploading freight price matrix in simple Microsoft Excel files. Follow this link http://np.internationalshippingusa.com and build your on-line freight calculator. The Beta version of the Freight Calculator Creator is FREE. Any comments and suggestions from professionals in the international shipping industry would be greatly appreciated. Note: Even thought this on-line Freight Calculator Creator is initially targeted to international shipping companies, it can be also used to build online price calculators in any other purposes: to create an automated price list for a store; make an inventory list for a warehouse, etc.